You may remember earlier I did a little tutorial on how I design using the computer program Word. This is lesson two featuring quilt blocks with triangles. If you are looking for lesson one, you can find it here. As I write this tutorial I am going to make the assumption that you read tutorial number one and have worked a bit with it. I am not going to be quite as basic with every single step. 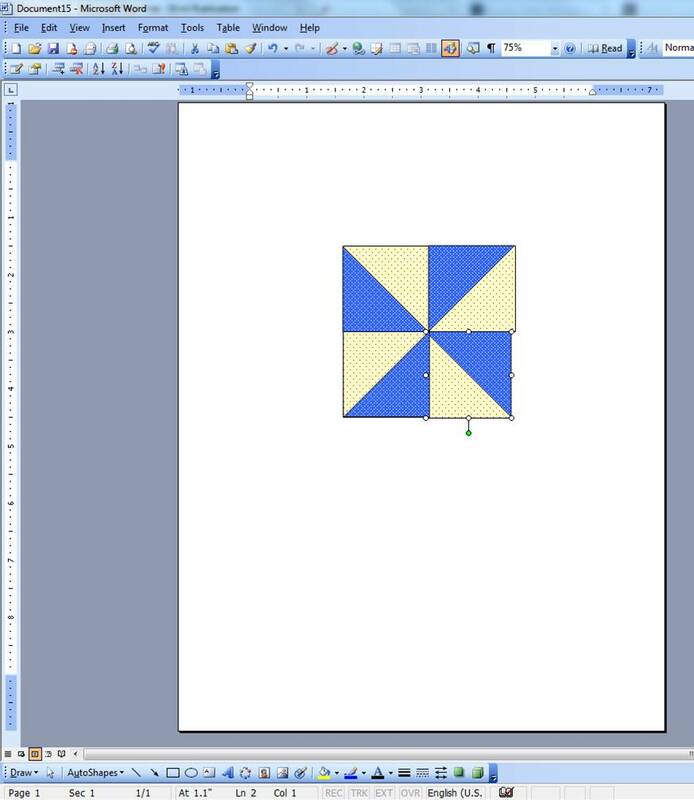 Let’s make a pinwheel block today. 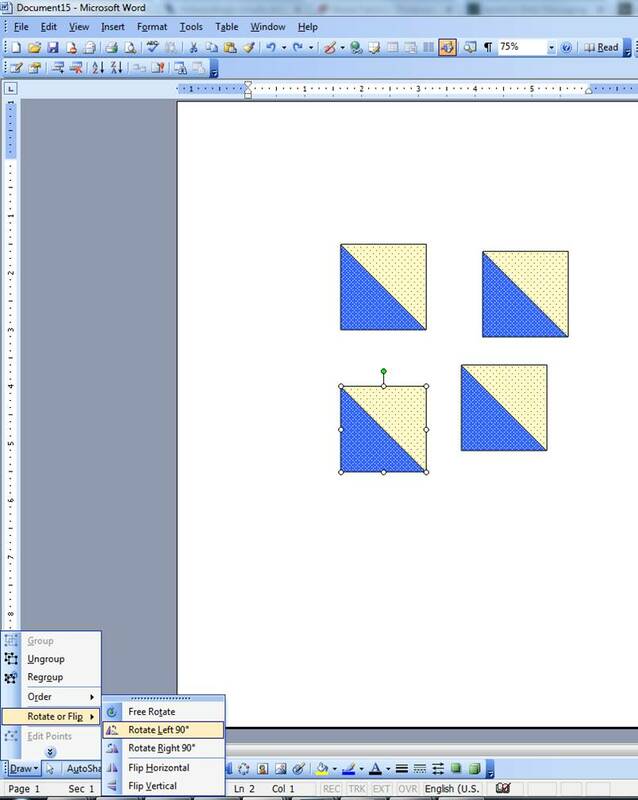 That will give you and idea on how to create triangles in case you want to branch out and do some of your own designing. 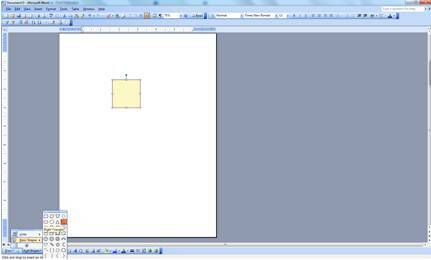 First step…open a blank document in Word. Go to Auto Shapes on your tool bar and click through until you find the square. Right click your mouse. Click on the square. 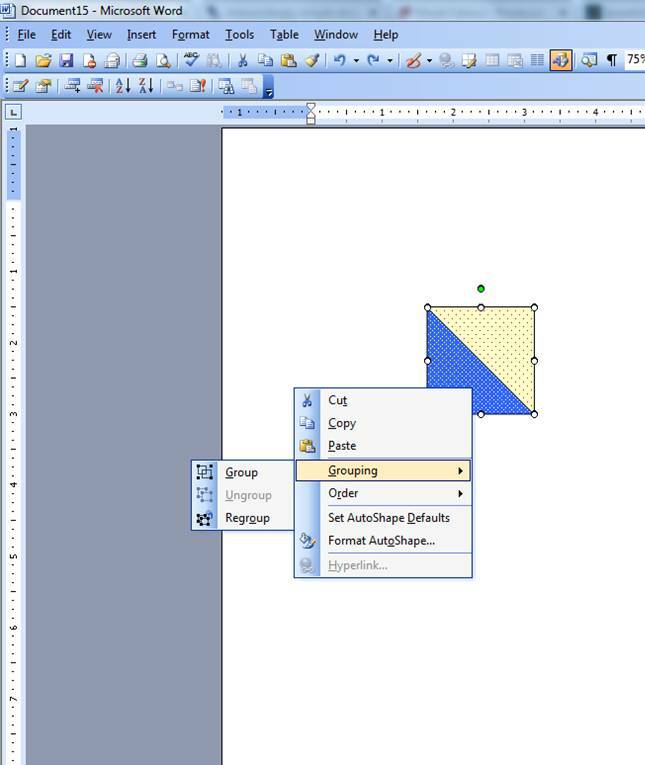 Go to the Format Autoshape option. 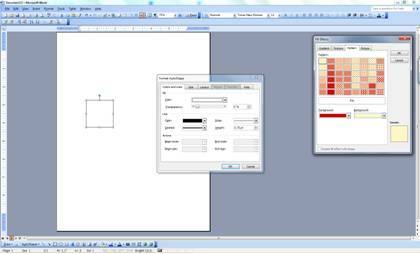 Under the colors and lines options Go to Color then Fill Effects. Pick your colors. Go to size option and select 1.5 x 1.5 for now. Then click through the okays. You should now have a colored square. Now let’s put a triangle inside the square. Go to autoshapes on your tool bar and make a triangle. Click on the triangle. Under the colors and lines options Go to Color then Fill Effects. Pick your colors. Go to size option and select 1.5 x 1.5 for now. Then click through the okays. You should now have a colored triangle. Click on the triangle and drag it so it covers the square. Now we want to group the square and triangle so they can move and be treated as one unit. We need to group them. Click on each object while holding the shift key down. Right clip and go to the grouping option. This was explained more in depth in lesson one so if you have trouble try re-reading that. Now we need four of those triangles to create a pinwheel block. Click on the first unit and then right click. Hit copy. Right click again and hit paste. Repeat until you have 4 units. Again, this was explained more in depth in lesson one. Now we need to take those units and create a pinwheel. Click on one of the units. Go to the Draw button on the tool bar. Click rotate or flip. Then pick one of the options. Units can be made to mirror images either horizontally or vertically. They can also be rotated a 90 degree turn. Continue with each object getting it in the placement you would like. Sometimes a unit will not go into place and will be slightly “off”. To fix this, click on the unit. Hold the control key down and hit the arrow key in the direction you would like the unit to move. If you hold the control key down then the object only moves one pixel at a time. If you don’t hold the control down and just use the arrow keys, it moves farther. Once your units are in the position you like, click on all the units, right click and group them together making one pinwheel block. That’s it for today’s lesson. 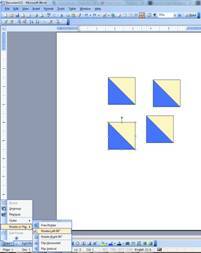 The goal was for you to be able to make triangles and for you to be able to move and rotate objects. There seems to be a lot of interest in this so I hope to be doing a whole series of these posts as time allows. Watch for the next one-we’ll learn how to put the blocks together with sashing and change colors. This entry was posted in Jo's Journal, Quilting on October 12, 2013 by Jo. Thank you for sharing this post! I will bookmark it to read later. Wow, I never knew Word had so many options!! I finally figured out how to set my fonts and spacing to the default I want!!! 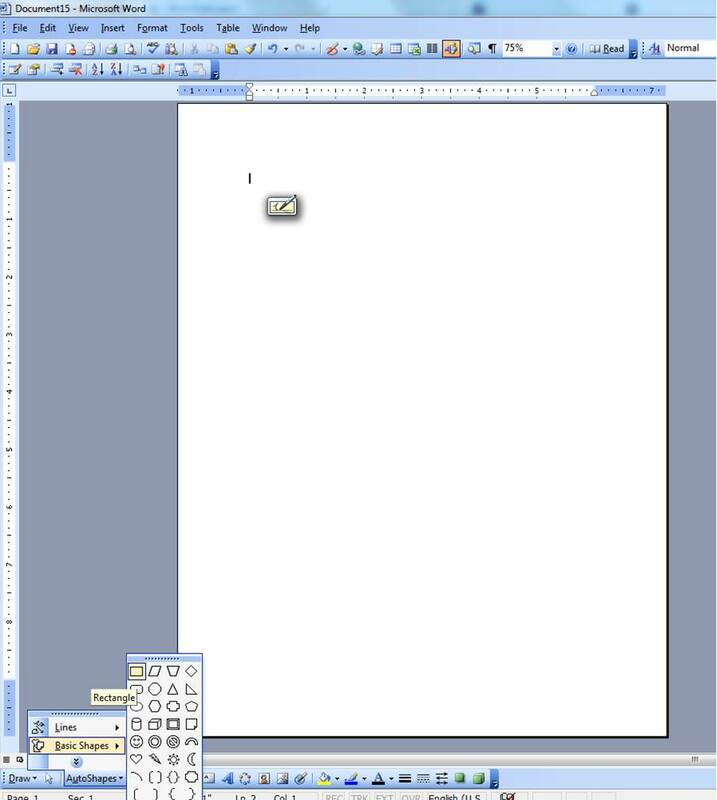 How many years have I been using a computer and never figured this out??!!! Amazing!!! Thank you :) Now to play with squares, triangles and all the other shapes I can find in there!! can you tell me what version of Word you have? bc those tool bars are not on my version. i spoke to my sister who is a computer wiz, mos tof the time she can explain things too me. I forwarded your email on that 1st tutorial and she said it wasn’t on her version. Thanks for the great tutorial, now I need to practice!!! I found your tutorial a half hour ago and have already designed a star block (with pretty fill effects), with your help I will be able to create a picture of my ideas without having to draw and colour with pencils and having to redraw as ideas change and mistakes are made. Have been reading your blog for a long time but for some reason I missed these tutorials. Thank you so much !!! Can you scan and upload your own fabrics for the fill? These are great tutorials. My only question is do you have any suggestions on how to put a design together once you have created your blocks? I am working on a memory quilt from t-shirts and my blocks are different sizes. I know that I can fill in with other fabric or blocks that will make up differences but wanted to plan the quilt out on paper first. I am very new to quilting and have never actually worked at really designing one. So far my designs have pretty much been willie nillie and done on the fly. We do two posts a day…one early morning and one late afternoon. I just discovered your site and find these design tutorials very interesting. I only see #1 and #2, did you do any more? If so, how do I find them. Thanks for sharing all the great information. I did only do one and two. I switched computers and therefore the programs changed a bit. It can still be done though. Publisher works much the same. Finally sat down and tried this. My EQ won’t work with Windows 10. I think another tutorial would be wonderful showing odd shapes. Thanks for taking the time to make these!